We all think about it and I think most of us ask that question at some point in our lives. There’s no way around death, we all face it, but for the approximately seven billion souls who inhabit this planet there isn’t just one option to that answer, there are many. Some of us think that no one knows the answer. That seemed to be Shakespeare’s conclusion when his Hamlet called death “The undiscovered Country, from whose bourn no traveler returns”. Some of us just think there’s no answer because there’s nothing to answer. We just end. The majority of us turn to one of the over 20 recognized world religions and thousands of subgroups within those religions for the answer. Others have a deeply held personal belief system that isn’t tied to anything recognized by those who recognize such things. When my own mind has been numbed and my own heart has been broken over a sudden and unexpected death, or any death, I look for signs that there is a place they go, a place we go, and a place where they can still reach us. There’s nothing rational about it, but being a person of faith, they comfort me. I’ve seen those signs dozens of times with several loved ones, but the one that remains with me, and is most powerful, came from my father. 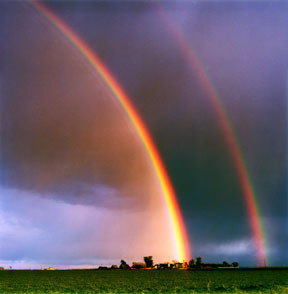 In May of 2003, he drew my attention to an enormous double rainbow that appeared after one of those fast and furious rain showers we sometimes see in the spring. He just stood there at the window, and said to me “well, sister, you don’t see that every day, do you?” He was almost stunned by it and he didn’t move until every piece of it vanished. Every time I saw him after that, I kept thinking of his almost childlike fascination with that double rainbow. About six weeks later, he made a point of telling me about a dream he had, an unusual move for him, but he wanted me to know because, as he said, “you’d understand these kinds of things.” The dream was that he was on a train, with a group of people he’d never met, going to the East Coast. When the train reached the coast, he boarded a boat, with the same group of people. I asked who the people were and he said, “the strange thing is, I didn’t know a soul, but it felt just fine to me.” He died suddenly one night in August a couple of weeks after the dream. People do strange things in grief, or what might seem strange to others, but after a few weeks, it made perfect sense to me to get into his car and drive to the East Coast. Each day, we’d drive until we couldn’t any more and close to where we stopped, we’d see a rainbow. We arrived at the coast, and still following the dream, we took a boat to an island. But before we did, coming into Newport, Rhode Island, we saw the most spectacular double rainbow I had ever seen, topping the one Dad had pointed out that spring. Ever since, the double rainbow, rare and beautiful, is my sign that life does go on. It has happened twice since the “trip of many rainbows”. Once to my husband, in Austin, Texas, right before he moved here to be with me in 2009, in the mid west. I hoped that was Dad’s way of saying he approved. About 9 months before that in Arizona, not quite six years after Dad’s death, I was in a very dark time for me and asked for a sign from my father that all would be well. It was Easter day, and, as is expected in the desert, it hadn’t rained for months. I was missing his guidance and his voice desperately. Just then a little flash of rain hit us, and at the end, a double rainbow. It was so big that almost everyone in the dining room where I’d been eating got up to stare at it. Those signs are just mine and they may be coincidence, the randomness of nature. I think not. I choose to think that they represent life, renewed and in a different form, but still… life, in a world both precarious and beautiful, a world without end. Beautifully written, Cindy. May your life always be filled with the gift of double rainbows. And I hope yours is filled with pink bubbles!! !